The trip was everything I could have hoped for and much more…the people, the places, the food, the activities and experiences were all top notch. After spending 10 years in the corporate world, Krista followed her creative and spiritual call to transform her life and follow her dreams of becoming an actress, writer and mother. In 2011 she began “Evolutionary Woman” workshops for women at In the Spirit Yoga and online and was invited (by Deb and Allison!) to lead transformational workshops for The Divine Destination Collection retreats in Muskoka. She has also done retreats in Tuscany, Italy and travels extensively, including climbing Machu Picchu, Peru during her YTT (Yoga Teacher Training). 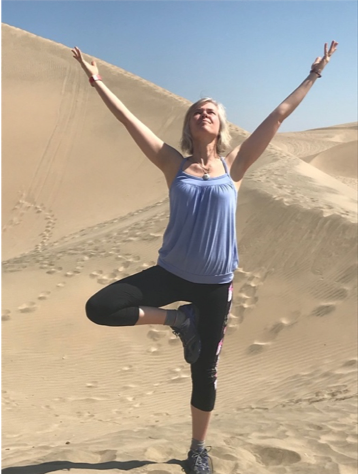 She is excited to be leading us in yoga along with walking the Camino with us this May 2019! Krista has worked hard to develop her spiritual gifts from Spirit (God/Source), allowing people from all backgrounds and walks of life to connect, experience and receive inspirational messages and healing in ways that are truly magical and often miraculous. She uses these gifts to bring people closer to the Light of who they really are, and shares messages of hope with love, gentleness, and joy! Krista is a certified Spiritual Director and Yoga Alliance-certified Yoga Teacher (RYT200) who initiated “SPIRIT YOGA” at In the Spirit Yoga. She holds a Hon. B.A. from the University of Toronto and will be pursuing a Master of Divinity in 2019. She has published two short books: “Song of the Beloved: A Mystical Journey”, and “Spirit Yoga: A Journey of Awakening in Peru through Spirit Yoga, Community & Love;” and is currently working on a third book, “A Daily Book of Miracles”. She has held monthly groups in Scarborough and lives in Toronto with her husband and beautiful family.